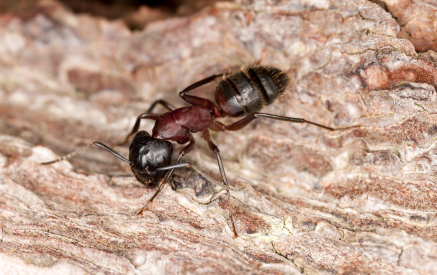 We have several species of Carpenter Ants in the New England area and they can be red, black or a combination depending on their species. They enter homes from outside sources and can cause structural damage. These large ants will generally nest in dead trees, injured trees or old firewood depending on the species. They chew out clean galleys within the wood, dropping sawdust and dead insect parts into piles beneath the nest. Mature colonies can have up to 5,000 ants and will send off winged swarmers to set up new colonies. Large colonies outside can eventually lead to an infestation within a structure. 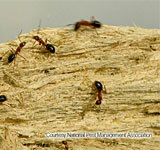 Carpenter ants prefer soft or moist damaged wood to make their nests and will travel up to 100 yards in search of food. Those of you that are NFL fans realize how far that is to travel for a little ant. Treating nests is essential for control. New products allow us to get to the nests without actually locating the nest. These products will also assure that all nests have been eliminated because 9 out of 10 times we are dealing with numerous nests and satellite nests. Be sure to hire a reputable pest control company that uses the latest products and techniques when treating for carpenter ants.